This historic church has been situated in three different states: Franklin, North Carolina and Tennessee. In 1789, George Washington was selected as the first President of the United States. In that same year, Richard Wood led an exceptional array of faithful pioneers to establish a Baptist church in a small settlement near the forks of the Little Pigeon River. This area, which later became Sevier County and Sevierville, was still a territory of North Carolina. The pioneers built a small log building as a place of worship and Rev. Wood ministered to them for 42 years until his death in 1831. The Forks of the River Church used the original building until the early 1800’s when the building was destroyed by fire. Spencer Clack, an outstanding pioneer and leader in the establishment of the church, gave a tract of land on Main Street near the old church cemetery. On this site, a second log building was erected and used as a place of worship and center of community activities until the late 1850’s.  The church became Sevierville Baptist Church and developed into a strong body of believers by the mid 1850’s. The church’s growth and development was brought to a sudden halt by the coming of the Civil War. Due to the pressing dangers of war, the members voted to disband on March 4, 1860. After seventy years, the little log church nestled in the forks of the Little Pigeon River was left for the perils of war. The church building was dismantled and used for firewood by the soldiers. Fifteen years later, a few of the original congregation reunited and found that the old building had been completely demolished during the war. On April 5, 1876, the few remaining members of the congregation met in the Sevier County Court House for the purpose of reorganizing the church. They called Rev. W.M. Burnett as the first pastor after the reorganization. For the first few years the congregation met in the Nancy Academy and later shared the building of the Southern Methodist Church. Then, in the fall of 1878, the third building of the church was completed at a cost of $1,443.29. The white frame building was located on Main Street near the old cemetery. Fruitful years followed and the need arose for a larger building to accommodate the overflow crowds. Under the guidance of Rev. R.E. Corum, the church voted on August 4, 1921 to move forward in a new building program. On March 5, 1924, the Building Committee decided to begin construction of a new sanctuary. The congregation was stunned when Rev. Corum died during the construction, but all members worked as one to carry on this work for the Lord. The building was dedicated debt free on September 29, 1940. In 1955, the need for more Sunday School space arose and, under the leadership of Rev. I.C. Frazier, an educational building was completed at a cost of $1,000,000.00. A major renovation of the sanctuary which began in 1984 was interrupted by a fire that severely damaged the interior of the building. The organ was rebuilt at a cost of $134,000.00. New carpet was installed, pews rebuilt, TV capabilities installed, and many other changes made to improve the facilities. The church observed its Bicentennial in 1989 with a year-long celebration. The climax of the celebration was the dedication of a new Family Life/Education Building that was completed at a cost of $1,800,000.00. In recent years, the church has purchased over three million dollars’ worth of additional property around the original building. In September of 1998, the Church moved into a new, ten-million-dollar sanctuary and educational building. First Baptist now has a membership of more than 4000 with an average of 1200 people meeting weekly for Sunday Life Groups. Rev. Dan Spencer is the 36th pastor to serve this historic church.